This is a shelf for effectively storing those 720 g jars, e.g. as used by "Odenwald" for fruit preserves, in a small space between kitchen cabinets. 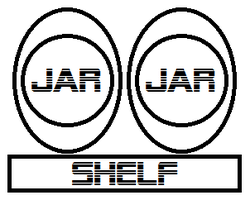 It consists of several instances of a shelf and two jars - hence the name. The maximum size was basically dictated by the already existing kitchen furniture and the jars that are great for storing lots of cooking supplies that are sold in flimsy plastic bags, e.g. lentils or semola. Placing the jars on their sides maximizes capacity as well as ease of access (once the lids are labeled). The shelf is mounted at an angle so the jars slide - if at all - only backwards and do not fall down. Blockboard was chosen as a material as it looks pretty cool when cut in the right orientation and I had some appropriately sized leftovers from building bigger shelves. One 85 × 15.5 cm and seven 12.5 × 15.5 cm boards were cut using a circular saw and a chop saw (the proper tool would have been a table saw to which I did not have access at the time). After some good sanding from all sides (120 grit), the small boards where arranged according to the would-be fronts so that darker and lighter boards alternated. The back sides where drilled with an 8 mm wood drill bit to receive two dowel pegs each. These were entered into matching holes in the larger board after applying some wood glue to the side of the small board. Two 4 × 50 mm wood screws per board made sure the glue received enough pressure and the connections some extra stability. 3 mm countersunk pilot holes were drilled to ensure a nice fit of these screws. Just a bit more sanding and done! putting the glasses in lid-first gives a nice overview of their contents! The jars (sides or bottoms) may eventually be laser engraved with the names of the contents and/or basic recipes. everything would have been a lot easier with dowel centers and a table saw which we have now, but not when I made it!